I’m Beth Wodzinski. I’m a writer. I publish and edit Shimmer magazine. I’m also into yoga and eating my vegetables. I live near Moab, UT with Sean Markey, three jellyfish, three dogs, and two cats. I work as a software quality analyst for the federal government. I grew up in upstate New York, in the rural outskirts of Ithaca. My parents went through a self-sufficency phase, with a large garden and various animals raised for food. 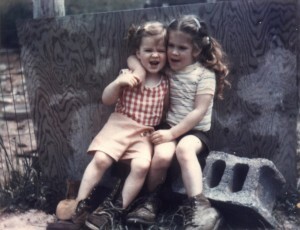 The picture is of me and my sister outside the cinder-block shed where the pigs, chickens, and geese lived. I’m the one on the right. I hang out on twitter a fair amount. Or get in touch with me via my handy Contact page.